We have our own fully equipped 170 sq mtr workshop where we manufacture (to your exact specification): doors, sash and case windows, handrails and balustrades, skirtings and facings and other bespoke joinery work. With our own workshop we cut out any middle-men and subcontractors ensuring that you receive the best value and highest quality of workmanship. 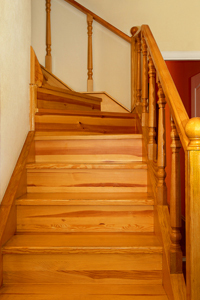 When you have already bought your own doors, skirting boards, wooden flooring or fencing for example, we can professionally fit these and provide all additional finishing as required. Our own custom built windows or pre-manufactured windows can be fitted in any type of property, including single and double glazed units, tilt and turn and sash and case. Unique profiles can be manufactured by us in our workshop, just send your drawings or have your architect forward them to us and we’ll provide a competitive quotation. Does your old kitchen need upgraded? Whether it’s a kitchen requiring custom cabinets or a standard kitchen fit-out we can handle every aspect of the project including planning, fitting, plumbing, electrical work, plastering and tiling. Whyte & Christie have a beautiful range of kitchens to suit any home. 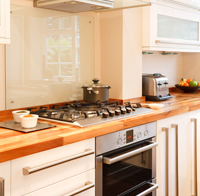 All our tradesmen are trained and experienced joiners, plumbers, plasterers and electricians making us your one-stop-shop for the perfect kitchen installation or refurbishment. Our designers will visit your home and take accurate measurements and provide you with options for units, cupboards, worktops and exciting options such as islands, breakfast bars and space saving solutions. Comprehensive survey of your existing kitchen. Advice on layout, gas, electrical and plumbing work. New kitchen delivered to your door. Removal of your old kitchen. Quick and efficient installation of your new kitchen. For more information on our Joinery, Windows Installation or Kitchen Installation services and for a free quote call us on 01475 722118, email us or use our online enquiry form.